We had a great time even though we missed Andi by a day. We stayed at the Jockey Club which is right next to the Bellagio, every night we had the opportunity to watch the Fountain Show every fifteen minutes. Paris was across the street and we could see as far north as Treasure Island. We sort of got screwed up a little bit in our timing because we were planning on doing our sightseeing/walking tour on Thursday Night, but instead spent that in Denver. When we got into town on Friday the first thing we did was go to the Grocery store to stock up (we had a kitchen in our suite). 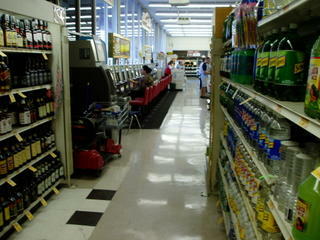 You know you're in Vegas when there's Slot Machines at the local Von's. We spent the day walking around the City and then went home to take a nap. We went to see Avenue Q at the Wynn on friday evening and had cocktails sitting on the patio. 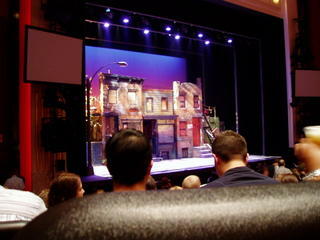 We had great seats at the show, they built this theater specifically for Avenue Q, so the seats were comfortable in a stadium seating arrangement. The show was hilarious and we laughed through most of it. Saturday we spent the afternoon at Jimmy's friends house (they had a big Chicago Style Birthday party for him) and Saturday night we went out to a few of the sad gay clubs. Sunday we spent most of the day recovering from our night of partying, it takes a lot out of you. We drove downtown to the old strip and rode a ride on the Stratosphere on the way back home.We finished up our tours by walking South on the Strip and ended up eating nasty pizza instead of a nice dinner. We did a little bit of gambling, not much, just a few dollars here and there. Sunday we ended up packing and going to bed early since we knew we had to be up early and checked out by 11:00 am. We got all done, got the car packed and went to the Liberace Museum which just happens to be in a strip mall along with a gay bar, a "weddin chapel" and a korean medicinal facility. Fortunately no one was killed (or murdered) we all got along for 5 days and enjoyed hanging out in the city.